EMAT or Electro Magnetic Acoustic Transducer is an Ultrasonic Testing (UT) technique that generates the sound in the part inspected instead of the transducer. 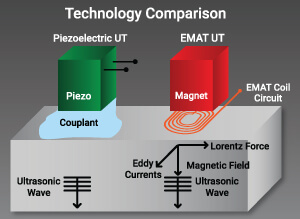 An EMAT induces ultrasonic waves into a test object with two interacting magnetic fields. A relatively high frequency (RF) field generated by electrical coils interacts with a low frequency or static field generated by magnets to generate a Lorentz force in a manner similar to an electric motor. This disturbance is transferred to the lattice of the material, producing an elastic wave. In a reciprocal process, the interaction of elastic waves in the presence of a magnetic field induces currents in the receiving EMAT coil circuit. For ferromagnetic conductors, magnetostriction produces additional stresses that enhance the signals to much higher levels than could be obtained by the Lorentz force alone. Various types of waves can be generated using different combinations of RF coils and magnets. Dry inspection. EMAT does not require couplant for transmitting sound, which makes it very well suited for inspection of very hot and very cold parts, and integration in automated environments. Impervious to surface conditions. EMAT can inspect through coatings and are not affected by pollutants, oxidation, or roughness. Easier sensor deployment. Not having wedges or couplant, Snell’s law of refraction does not apply, and the angle of the sensor does not affect the direction of propagation. This makes EMAT transducers easier to control and deploy. Ability to generate SH modes. EMAT is the only practical means for generating shear waves with horizontal polarization (SH waves) without high mechanical pressure or low-density couplants that impede scanning of the part. Mode selectivity. The antenna-type construction of the EMAT coil combined with a multi-cycle excitation provides great specificity in the frequency domain, thus the ability to precisely select the wave mode of interest, which is of great importance for guided wave generation and interpretation.